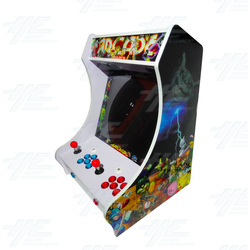 Barcade desktop 2 player arcade 19 inch machine, with 1 red joystick and 6 blue buttons for Player 1 and 1 red joystick and 6 red buttons for Player 2. White Cabinet with 2 additional buttons mounted on front. Barcade desktop 2 player arcade 19 inch machine, with 1 red joystick and 6 blue buttons for Player 1 and 1 red joystick and 6 red buttons for Player 2. White Cabinet with 2 additional buttons mounted on front.